Condition of the pool area and smell in the stairwell like cigarettes. Great check in clean had nice breakfast and had a great checl out. Where to find Beckley hotels near an airport? Where can I find hotels in Beckley that are near tourist attractions? You will find a good range of Expedia-listed hotels to select from when you are booking your vacation in Beckley. Beckley offers 17 hotel options within a 0.1-kilometre (0.06-mile) distance of the downtown area. 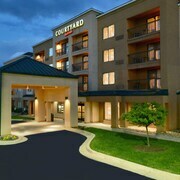 Convenience is everything when it comes to stress-free vacationing, so check out the latest deals at the Courtyard by Marriott Beckley and Fairfield Inn & Suites By Marriott Beckley, which can be found within 1 kilometre (0.6 miles) of downtown Beckley. Ghent is an area that lies 19 kilometres (12 miles) from the main part of Beckley and has the biggest range of Beckley accommodation. The Knights Inn Ghent and Skyline Resort are amongst the places to stay in Ghent. Oak Hill around 25 kilometres (15 miles) away is where you'll find Comfort Inn New River and Holiday Lodge Hotel & Conference Center. Expedia hotels in Fayetteville include The Morris Harvey House and Quality Inn New River. Fayetteville is 30 kilometres (20 miles) away. Families, students and those watching their budget will find some great Beckley room options that won't that won't make the bank manager's jaw drop. 3 kilometres (2 miles) from Beckley's downtown is where you'll find the Comfort Inn Beckley. The Baymont Beckley WV is only 3 kilometres (2 miles) away. Two more Beckley hotels in the cheaper range include the Econo Lodge Beckley and the Super 8 Beckley. 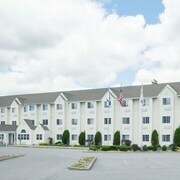 The Holiday Inn Hotel & Suites Beckley can be found 4 kilometres (2 miles) from the central part of Beckley. 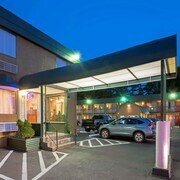 Or, alternatively, the Country Inn & Suites By Carlson Beckley is located 4 kilometres (2 miles) away. 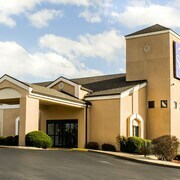 The Hampton Inn Beckley and the Quality Inn are some alternative Expedia-listed accommodations around Beckley. If you have time left, you should visit other parts of Southern West Virginia. Lovers of the great outdoors will appreciate Southern West Virginia's rolling hills. In addition, you should explore a selection of its history museums. In this part of United States of America tourists might also partake in mountain biking, hiking and horse riding. 75 kilometres (46 miles) away from Beckley you will find Charleston, where you can find University of Charleston and Charleston Town Center Mall. Charleston accommodation options are the Embassy Suites Charleston and Charleston Marriott Town Center. Or stay in Bluefield, 55 kilometres (35 miles) to the south of Beckley, where you can choose from the Quality Hotel and Conference Center and Econo Lodge Near Bluefield College. If you're staying in Bluefield, set aside a little time to check out the Bluefield State College and Mercer Mall. Raleigh County Memorial Airport is a practical airport for flying into Beckley. It is 6 kilometres (4 miles) away. 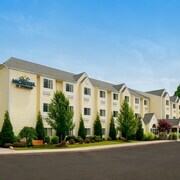 Microtel Inn & Suites by Wyndham Beckley East is a nearby hotel. What are the most popular Beckley hotels? Are there hotels in other cities near Beckley? What other types of accommodations are available in Beckley? Explore Beckley with Expedia.ca’s Travel Guides to find the best flights, cars, holiday packages and more!